PHP Scripts Mall likes to live the new readymade PHP Crowdfunding Scriptfor the users who trusted to invest money for the successful fundraising with ease of use and flexible customization. This script is different from other crowdfunding scripts with their unique functionality, features, and user attractive templates and interfaces with support in all formats of the screen with high-speed page loading customization. It is mandatory now for the users to develop their crowdfunding site which gives you benefits of the build your traction, social, refine your ideas, and successful investors. 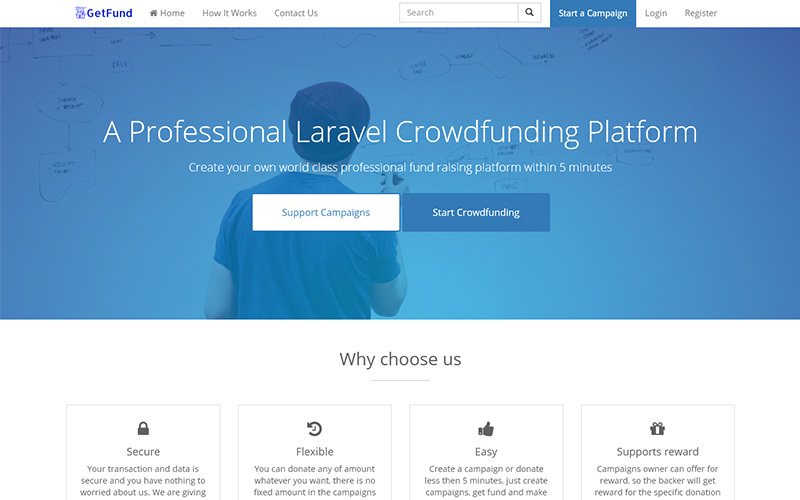 Our Crowdfunding Clone PHPis built in open source php platform where the codes are flexible and it can be customized as per the user requirement. The main advantage of our crowd-funding which is differs from other is that the investors can select their investing Crowdfunding campaign from our unlimited crowdfundinglisting campaigns like community projects, fashion, foods, the non-profit organization, and innovations etc. This Website Donation Scripthas authorized log-in portals for the users to sign in to the system byconfirming their account by the admin, the user can able to see the clear user interface with advanced customization and navigation for the users to search and access the script in the efficient manner. The investors as we mentioned earlier can select their campaign and invest, also they can start their own campaign by creating the campaign information and credentials. The user can mark the target date or campaign end date after the goal is achieved or end date. The user can manage their accounts and payments details in the efficient way. In thisDonation Crowdfunding Software, the user can get the reward according to the amount, the campaign status, payments and withdraw details areeasily monitored. The admin can view and manage the overall site, in the admin dashboard all the credentials of the users and campaign are managed by the admin, the admin can also see the report of all campaigns, staff picks, funded, blocked campaign, pending campaignetc in reliable and user-friendly. The Donation Crowdfunding Script is the best revenue script for the campaign owners and admin, where the users or campaign owners can get the campaign commissionand also the admin, can get the revenue by using the banner advertisements, Google advertisement etc., in the site. The admin can also manage the general settings,the payments settings and theme settings in simple access. This script is designed with SEO-friendly URL and designed with rich snippets, so it will be easy for users to interact with the site. In addition along with a purchase of the script, the script will be live in 24-48 hrs. from the time of purchase, also 1-year technical support, and 6-months free software update. I got the crowdfunding script with clear understanding the ideas of my project requirement. Finally am happy with this script. After receive the source code from you then I install it then feel like surprised scriptthan I expect. Professional script with extra effort to fulfill my every single note of customization. Good knowledgeable developer team to hire.